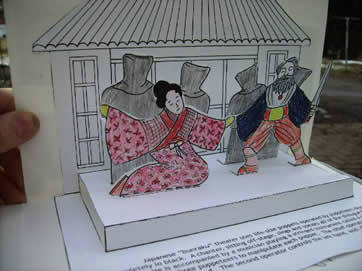 A pop-up picture showing a typical scene from a Japanese Bunraku theater performance. This type of theater is the main subject of the popular book The Master Puppeteer by Katherine Paterson. This really depends on the age of assembler and how quickly (or slowly) he or she works. For the average students, allow about 45 minutes (including both coloring and assembly). However, you know your students better than I, so you can probably judge how long it will take just by looking at this sample picture.